Are you in need of some enchanting Italian music? Some splendid Italian architecture? How about some good old Italian theatre? Then the Montreal’s Museum of Fine Arts has something in store for you. The Concert. 1741. Oil on canvas, 60 x 48 cm. Splendore a Venezia: Art and Music from the Renaissance to the Baroque in the Serenissima explores the interdisciplinary relationship between Venetian music and the fine arts. Between the 16th and 18th centuries, Venice resembled the United States as it is today—a global power feasting off its assets. Quick historical insert—Venice was at its prime as a parading, independent republic before Napoleon set things askew. The exhibit’s attention is on three themes: art and music in the public sphere (think gondolas and street musicians), art and music in the private realm (think private salons), and finally art, music and mythology (think Apollo). etian history between 1488 and 1797. One of the most important dates to keep in mind is 1501—when Venice was honoured as the center of music publishing, thanks to the standardization of modern musical notation—everyone agreed on one way to depict music on sheets, with a five line staff, read from left to right. The beauty of the exhibit undoubtedly lies in the artifacts. You are immediately bathed in everything opulent. For instance, the first room explores Venetian history by showcasing beautiful Procurators’ red velvet robes. Continue your ambling as you listen to excerpts from Giovanni Picchi and Antonio Vivaldi, or just a continuous loop of Vivaldi’s Gloria RV 589, peering at the richly decorated hymn books. Also on display are the oil paintings by the likes of Titian and Tintoretto. They depict typical Venetian scenes, where citizens convene at the San Marco square, bargain for pears and go out to eat gelato. With the winter weather creeping upon us, Venice looks like quite an attractive destination indeed. As you walk through the exhibit you get an overwhelming sense of pompousness and pride —seemingly what Venice must have been like back then. It appears to have been a virtual hotbed of culture, bathing in a golden light. The museum placed a gondola in one of the rooms, where visitors can gaze at the lacquered black painted taxi boat, a tradition that still lives on in Venice today. Yet another feature are the instruments. The museum went out of its way to find extraordinary instruments you would be hard-placed to name. For instance, have you ever heard of a cornett? What about a zil, the 16th century trombone or a naqqara? These long-forgotten instruments are given a second life, so to speak. Also on display is the Milanese mandolin made in 1762 and decorated with ebony and ivory. As Francesco Sansovino once said, “music has its own cult in this city.” He must have been right, judging from the amount of music played in the Italian città. As the exhibit elaborates, there were two main establishments which took music seriously: the ospedali and the scuola (school). In the simplest of terms, the ospedali (loosely translated to hospital) was an operation offering food, lodging and clothing to orphans. Founded by a Franciscan brother, the ospedali also encouraged music. 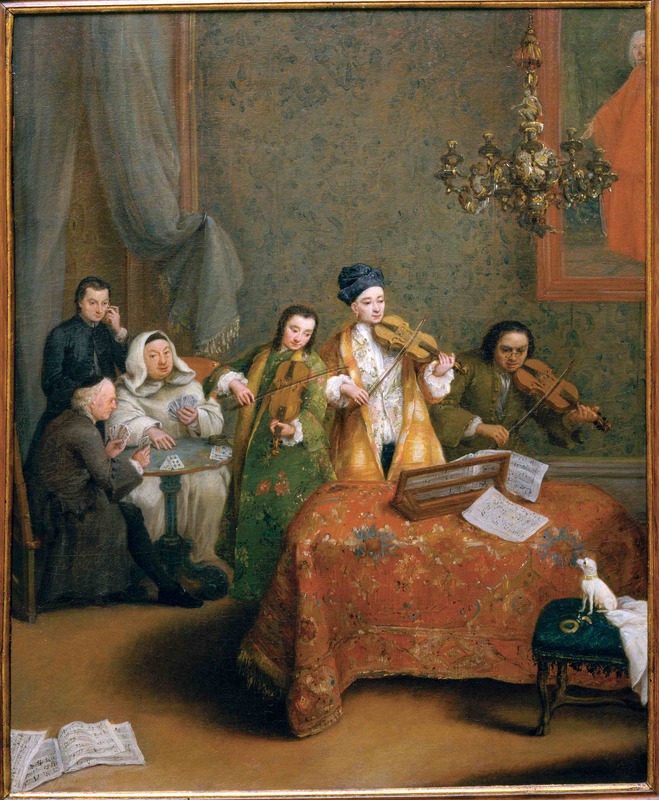 Orphans were taught music by none other than the string instructor Antonio Vivaldi. As for the scuole, they were spiritual associations which promoted music. By the end of the 16th century, there were six scuole (schools) in Venice. Finally, we come to the opera. Did you know that the Teatro San Cassiano was the first theatre in the world to present opera to the general public and be financed solely through ticket sales? Visitors get a glimpse at rosy-cheeked opera divas and highly prolific composers such as Tomaso Albinoni who scripted more than 80 operas. In its prime, Venice was flooded with culture and refinement, and the Montreal Museum of Fine Arts has achieved a rare means of marrying the eye to the ear. Splendore a Venezia: Art and Music from the Renaissance to the Baroque in the Serenissima exhibit runs until Jan. 19, 2014 at the Montreal Museum of Fine Arts.